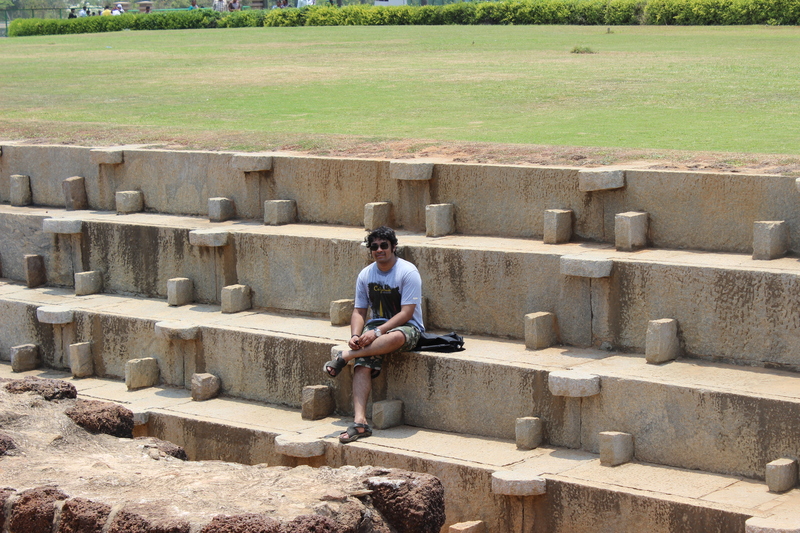 'Rock'On Mahabalipuram! - Ghumakkar - Inspiring travel experiences. Chennai Calling..!! Thanks to the Organization for which Rakesh works, for hosting their 10th Annual Event celebrations at ITC Grand Chola, Chennai. We were royally treated to great food, luxurious accommodation and amazing cultural programs.Thank You !! 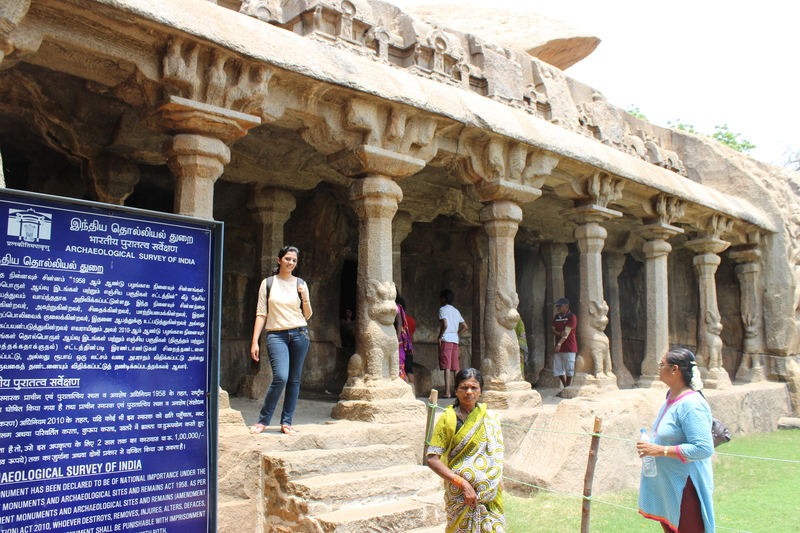 And on this pretext, we even got a chance to visit Mahabalipuram, the city famous for its rock-cut temples. 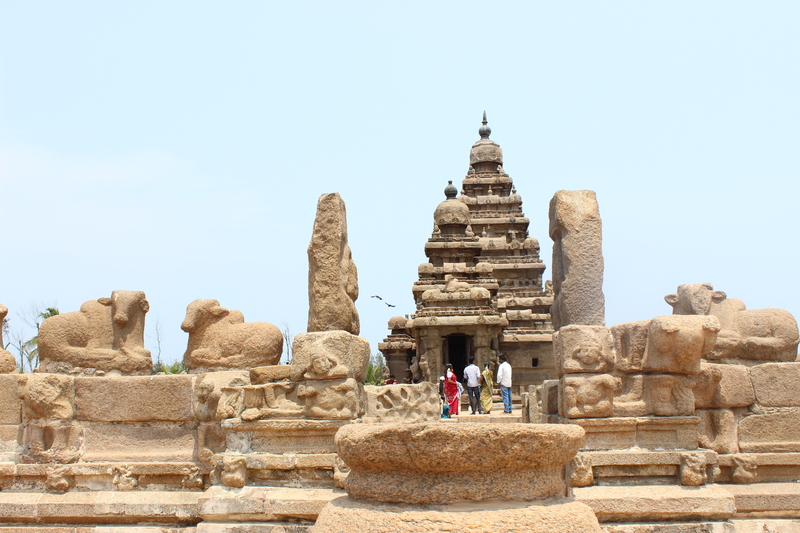 So, we set off to Mahabalipuram from Chennai by road on 13th April,2014 to explore the marvels of Pallava architecture. 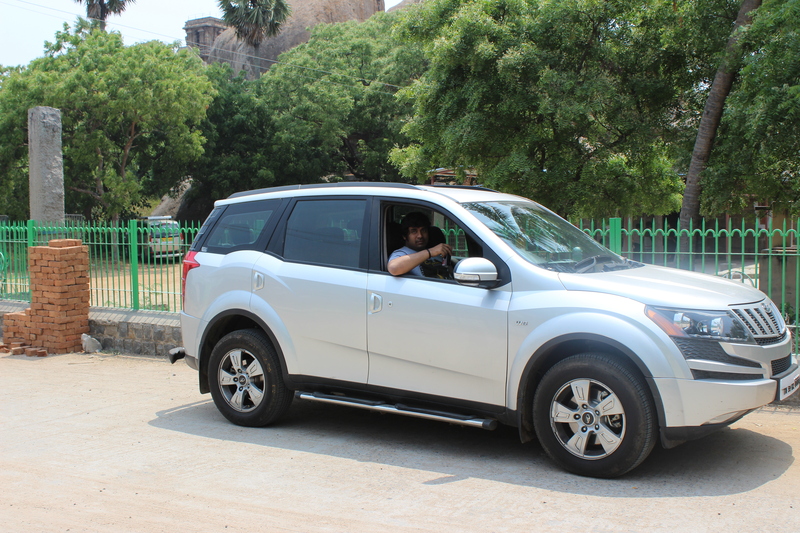 Special thanks to Arun for entrusting his new Mahindra XUV to us. :) And yes I would also like to thank the Technology, ‘GPS’ for guiding us to our destination. Otherwise it would have been very difficult for the fact that we either speak or understand Tamil even if we wanted to take teh directions from locals. The weather was very humid and sultry,no wonder we were in Chennai. But, the drive all the way made it worthy. It being a Sunday was an added advantage,The roads were less crowded allowing us to enjoy the drive. I was delighted seeing the passing Churches, Lush green fields and not to forget to mention the bay of Bengal. The East Coast Road (State Highway 49) is worth mentioning. Very well maintained and wide road hosting many places of interest like Dizzee World, crocodile Park, ISKON Temple,etc. You can stop over these places if you have around two to three days on hand for the trip. Otherwise you would miss the Shore temple at Mahabalipuram as it closes by 6 in the evening. And yes, for those of you starting early morning, there is Sarvana Bhavan on the way to answer your hunger pangs. Hoardings bearing advertisements for the Villas are a common sight on the highway. With Magidi Magidi (from Kadal, listen to tamil songs when in Chennai :P ) song playing in backdrop, we cruised our way uninterrupted through a distance of 52 Kilometers to reach our destination ‘Maha’balipuram in an hour without any stopovers except for those at the Toll gate entries. This the first temple we visited upon our arrival. The main diety Vaaraha Swamy is painted in vegetable dyes.The priest of this temple has narrated us an interesting story with respect to a passage that led to Kanchipuram from here. After Chalukyan king Pulakesi II got defeated in the hands of Narasimhavarman,he dug this passage to escape. Many years later, the passage was closed. I’m not sure how far this is true, But I’m sharing this info as I found it interesting. 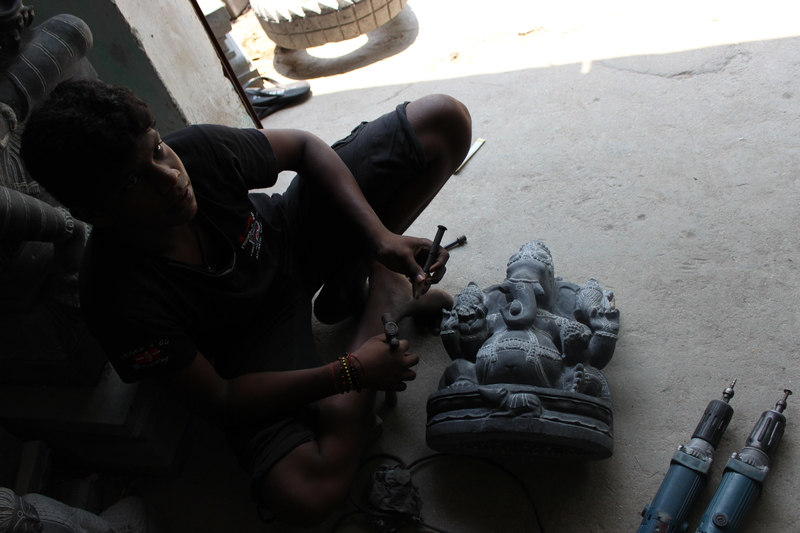 Surya, sculptor making intricate design on the Ganesh Idol. The streets bustle with Tour Guides and the book hawkers trying to convince that it’s a sheer waste to go around without their guidance/books on the history of the city. One of them has somehow convinced me to buy one of those books. This book on mahabalipuram has actually helped to understand the history behind the town better. Arjuna’s Penance Bas relief is very famous here.There is a legend behind this. King Bhagirath wanted to purify the souls of his ancestors by bringing down ganges from the heaven. When he realized that this would submerge the entire earth, he underwent a penance to convince Shiva to avert the calamity by letting the flood water to trickle in his hair locks there by dispersing the flood water into innumerable rivulets. This phenomenal event has attracted the interest of the animals which arrived to watch it. 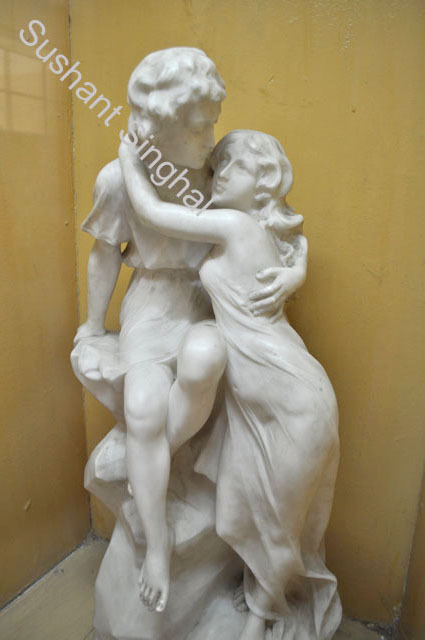 This can be seen the below photograph. 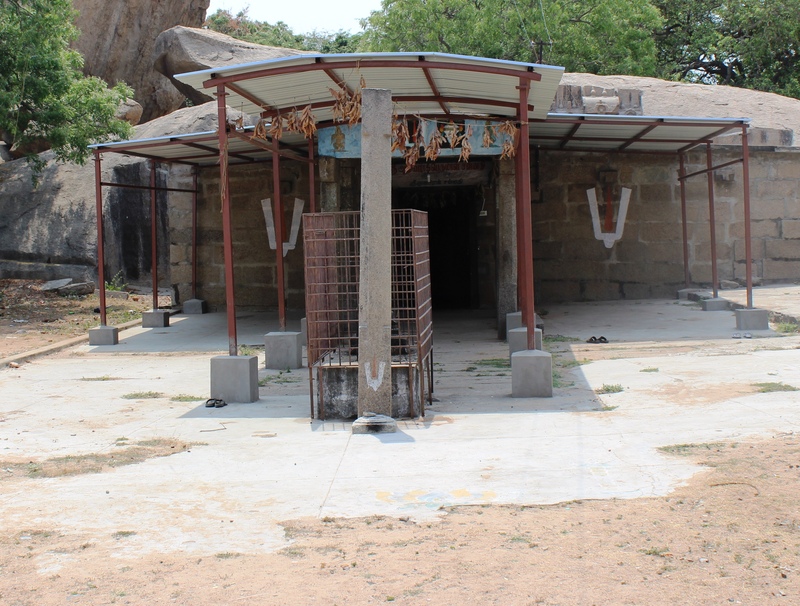 Adjoining to this is the Pancha Pandava’s cave temple, the largest cave temple in mahabalipuram. 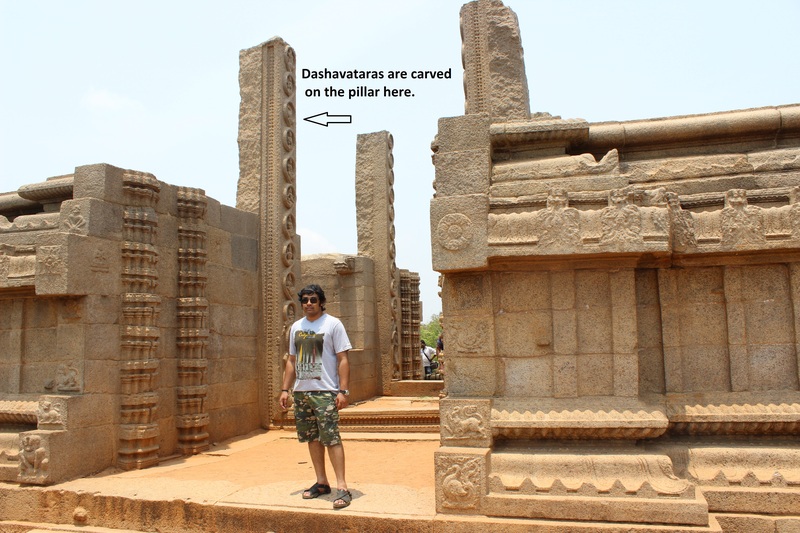 These monuments are monoliths carved out of granite stand tall displaying the mastery of sculptors during the Pallavas. The work on these structures has been discontinued following the death of Narasimhavarman I. All the rathas are located nearby and are named so since they represent the wooden chariots of each of pandavas. This unfinished structure leaves you in awe wondering what it would have been had it been completed. My imaginations knew no bounds when I pictured a beautiful pagoda temple completing it. 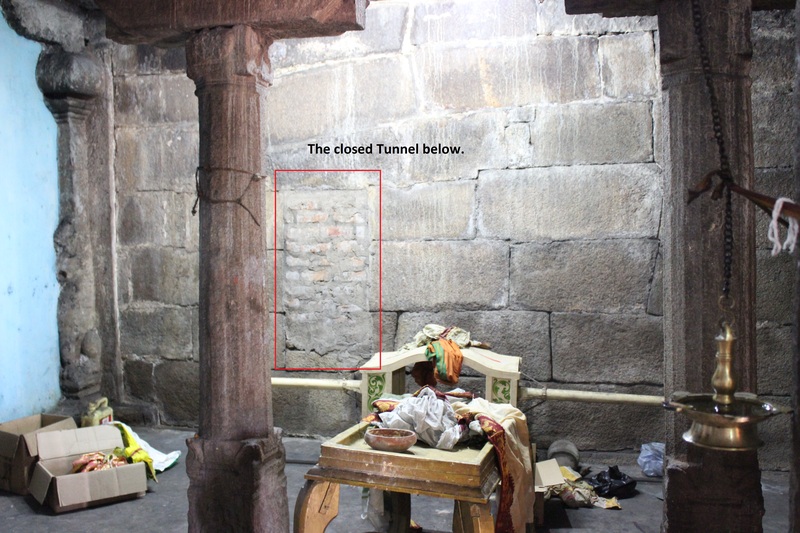 The 10 avataras of Vishnu are carved on the pillar hinting you what it could have been if completed. The walk all through need lots of stamina and energy. Make sure that you carry an umbrella and keep yourself hydrated all the time. There are vendors selling raw mango slices, water melon slices and coconut water.These helped us survive the soaring temperatures. 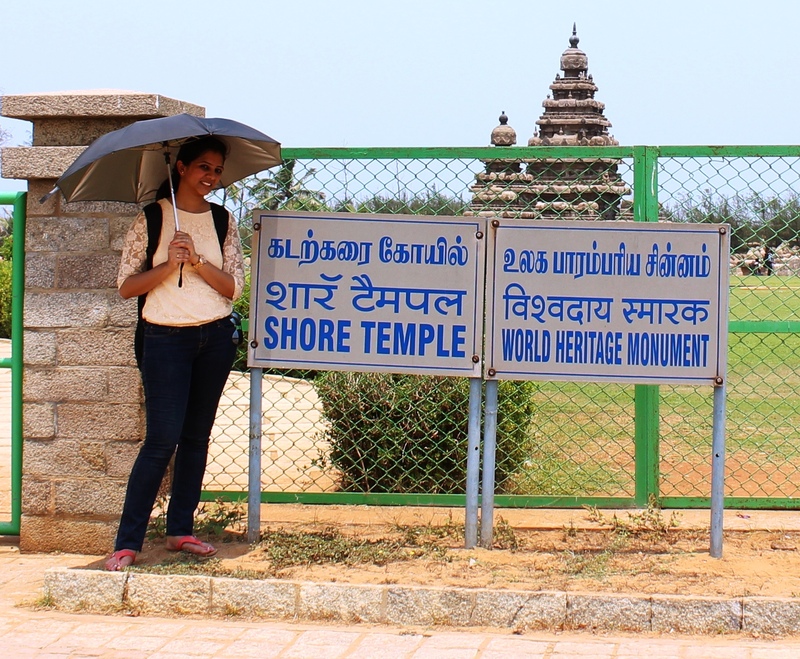 At last we arrive at the much awaited place of our trip, The shore temple. The entry ticket is rs.10 for Indians and rs.250 for foreigners. This place is thronged with guides as much as with public. We walked slowly savoring the beauty of the mighty bay of bengal on one side and the temple on the other side. From a distance the temple looks amazing with a sea backdrop. The walk way from the entrance to the temple has wire mesh all through and we can often see hawkers displaying their conch shells, sea related paraphernalia,etc through the other side. After a walk of 10 minutes we arrive at the temple. Bliss! I was completely taken away by its beauty and serenity. The Temple is built in such a way that it absorbs the first rays of the sun in the morning and illuminates the sea water after sunset. The steps leading to the Gharbha Gudi (sanctum sanctorum) were steep and one should watch his steps. This temple has shrines of both shiva and vishnu. The sanctum sanctorum belongs to Lord Shiva and there is another shrine where Lord Vishnu is illustrated reclining on Shesha nag. The temple is constructed of stone rather than being carved out of stone. This is the first temple of its kind during Pallavas rule. After touring around the temple we dropped the idea of going to the beach. Thanks to scorching heat and hurting heels!! No wonder this place has been given the status of UNESCO World Heritage Site.! Very well written , last couple of pics are too small. Many time I made plan to visit Mahabalipuram while my Chennai tour for my official work but till date not able to materialised. Thanks Mahesh! I had trouble in uploading the last pics..Shall try uploading them again. And yes, Mahabalipuram is a beautiful place. Must not be missed! You did the right thing buying the guide book. Actually, whenever you go to a place, buying guide book/photographs helps you to know about the place as well as to take nice photos of that place. And you also contribute your bit to the locals. Thanks Anupam! Buying the guide book did make a difference. We got to know the places to visit and the history behind them. It made our trip much easier. Nice post, last 5-6 photos are good but small in size. Thanks Vivek! had problem uploading the last few pictures. Shall try uploading them again! Welcome to the family! You rocked with the rocking write-up. For photos please contact the editorial. They will fix them amazingly. Great trip with excellent narration. Keep rolling! Thanks for sharing & inciting the travel bugs! very good and informative post.had heard a lot about Mahabalipuram,but this is the first time i am getting a good detailed look of the place with your eyes. How to travel from Indore to Mandu? MP tourism off in Delhi says there are no buses from Indore to Mandu, or are there any? how much time does it take to travel the distance? How much Time is required to visit Mandu sites etc. If you don’t mind can you forward your cell no so that I can contact you. Dear Puspendra – Please ask this question on posts which are on Indore or Mandu. I have driven myself from Indore to Mandu so do not know about the buses but am sure one can go to Dhar and then take a local transport to Mandu. We also drove down from Chennai on our trip to Mahabalipuram (guess it is now called Mamallapuram) and I so agree with you on the language part. We did a few rounds in the city before figuring out ECR. It was in early 2006 and no good GPS during those days. 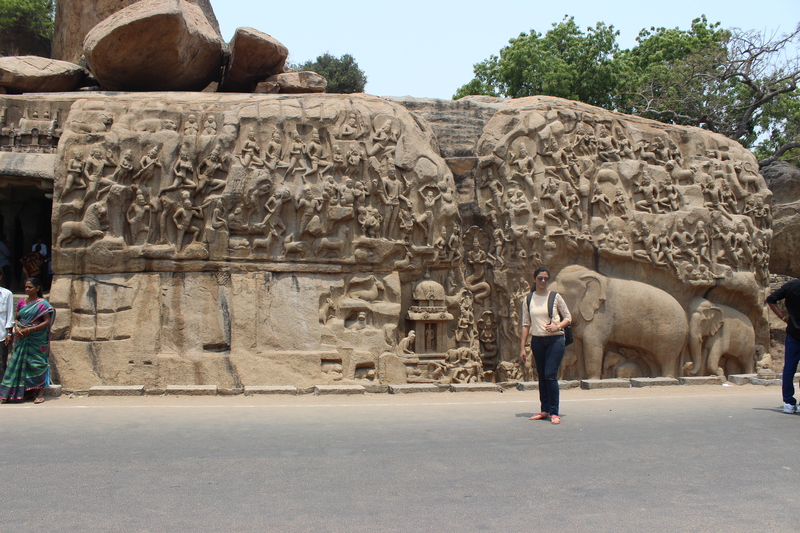 Mahabalipuram is a sculptor capital and your fluid narration explained it well. For pics, please send me those at info AT ghumakkar.com and we would put them at a good optimum size. For each picture, please also send me a 5-8 word caption. Wishes. Thanks Nandan ! I shall mail the pics to the mentioned id. And what better way to start than the marvels of Mahabalipuram Temples. I happened to be in the neighbourhood but could not visit. TN is full of temple trove whichever direction you set out in. Thanks Nirdesh! I so agree with you! Tamil Nadu is seriously a treasure trove of temples. And you should visit Mahabalipuram as it proves to be a Temple City!